Off for a cruise on this lovely Fred Olsen ship. 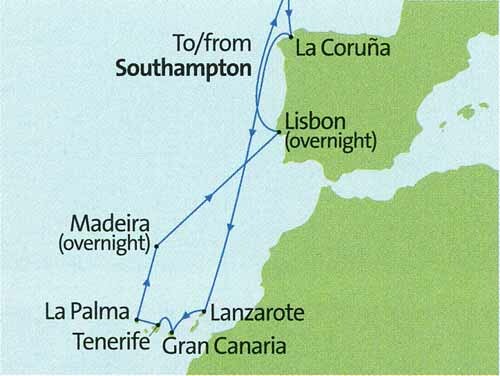 The MV Balmoral, photoed at Santa Cruz de Tenerife, middle right. There are two trains per hour from Waterloo to Southampton Central. Take a taxi to the ship, which is just too far to walk. Parking in very expensive in Southampton. Leaving Southampton in the evening. The New Forest is across Southampton Water. Up at a reasonable 07:30 & the taxi came at 09:30 on schedule. Although he was not fast, hence expensive @ £20, he got us to Waterloo in time for the earlier train, so we were equally early at Southampton. The taxi trip should have been short (yes) & quick (no) but we were stuck in a queue at the terminal, which cost us more than £3 of hanging about time. This was because both Balmoral and Black Watch were in together & they were sorting out the confusion between the luggage. We were there at about 11:40. We had our free coffees and Avis had a sandwich (£2.95). They started loading at 13:30, so we were soon on but it took quite a while for the luggage to catch up with us. Meanwhile, we had tea in the Palms Café. The ship has apparently just come out of refit (a bad sign) but only the pools seem to be out of action at the moment. As it is 7 years since we were last on, we are not noticing the difference. We were on a table for 4 at dinner with a very old couple, 85 & 89, Margaret & Norman, he rather deaf but not objectionable. We had asked for a table of 8 (big round one). Usual good food. I had an Incik. The show team are good. I had rung the Cruise Director Jennifer before & met her after the show but she should be ok for speakers, I think, short of a norovirus outbreak. I was glad to get to bed before 10 after putting the clocks forward for Spain on Saturday. Up at 8, reluctantly. Tea is now served in private pots at breakfast, a better arrangement. After the port show for Lanzarote, which had useful tips about how to have a good time in Arrecife, I tried walking round the deck. The sea is fairly clam but it was windy & walking restricted by work still going on, so, with a lady I had picked up, we went to the top deck, where one could walk but it was very breezy & gave up after 3 circuits, which are not very long up there. Otherwise, I chatted & worked on my history talks. We had to queue at the Avon Restaurant for lunch. There were queues at all the restaurants, as everyone goes at 13:00. We had been chatting, so were that late. The so-called classical concert was a guitarist, who was quite good but the programme was rather lightweight. It included the wretched Spanish Rhapsody, which is what had been going through my head when Jane died. It was a formal evening, so it was frock-watch night. Some things are going wrong, not like last year but the nibbles at the Captain’s Cocktail Party came out as we were leaving, so we didn’t get any. I thought the timing was a bit odd, anyway. At dinner, it was obvious that Margaret & Norman are all over each other but not married. I told them to, as it makes a difference to the paperwork when one of them dies. The show had a nautical theatre & after some songs, mostly not very good, they did a mash-up of Pinafore and Pirates pieces mixed up. They were good again. I had seen the team earlier in the day & congratulated them for last night. They did the Admiralty Lord’s song & I told Jen after who the victim (W.H. Smith) was, as she did not know. We had lengthy hot chocolates in the Library with another couple after. URL: http://www.art-science.com/Tourism/Cruises/CR2013/index.html Last revised 4/2/2018 ©2018 Ken Baldry. All rights reserved.